The Stainless Steel Short Finger Goniometer is used for easy range-of-motion measurements of metacarpal, phalangeal, and interphalangeal joints. Linear inch and centimeter markings on both sides of protractor in opposite directions. 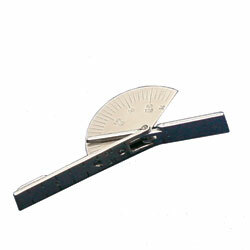 The protractors measure 0-150° in 5° increments. Latex free. Measures 4 inches long.